Exophase's GBA emulator. Thanks to tweaks and dynarec it can run A LOT of games fullspeed with sound! Some fixes and enhancements by notaz. Also, if you could get Kirby and the Amazing Mirror Working That would be awesome! "Please note: The comment section is NOT intended to ask for help. Please use the I need Help-Section at the boards." Does anyone understand that nothing ever gets done on those stupid help-section boards! Can't someone just tell me. MG! 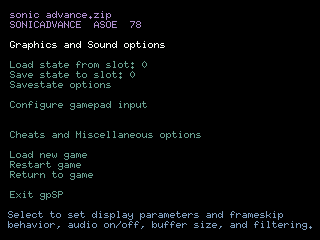 well you might try replacing the gba_bios.bin file with another one from a different source. I'm about to try that myself (as I have been having the same problem) I'll let you know how it goes. I've got a GBASP with two EZF Advance cards but you can never have enough GBA games to hand. I followed the tutorial on dumping the bios at https://wiki.gp2x.org/wiki/GpSP and https://wiki.pocketheaven.com/GBA_BIOS and my md5 matches up. My roms came unzipped so I zipped one to test (Alien Hominid) and it hung at the rom selector. The emulator starts showing the unscaled GBA screen in the top left of the GP2X screen. When entering emulator options and exiting without changing anything the GBA screen is then scaled fullscreen. A minor irritation I'm sure will be fixed at a later date. I've tried about 30 games at the default 200MHz. It really depends on what type of game it is whether it'll benefit from more horsepower or not. I've found Klonoa 1 & 2 and CT Special Forces 2 to be fluid at 200MHz. I've had a few random crashes in games. CT Special Forces 2 crashed during level 1 (the helicopter level) but I've played through a few levels since without incident. Final Fantasy 1 & 2: Dawn of Souls although perfectly playable at 200MHz became annoying to play due to crashing. I even downloaded another ROM and checked their md5 checksums and they matched. And then I can play Boulder Dash EX, Klonoa, Polarium, Medal of Honor: Infiltrator and Dr Sudoku without any problems at all. I imagine there are some bugs that need ironing out of the system. Ultimate Card Games (I love this game) works fine except at the start the buttons don't highlight so there is a graphical issue I haven't seen on other games I've tried. Minor irritations aside I'm enjoying this emulator a lot. This emulator is beating PocketSNES as my most used application. I am absolutely loving this. Great, great, amazing job. im having issues with the screen sizing i have it set to fullscreen but every time i restart the emulator it goes back to a non fullscreen view...am i doing something wrong or is this a bug? Well since this new release I've played Final Fantasy 1 now for 65 minutes and it didn't crash so whatever you did seems to have worked. for the full screen bug, you have to set it to full screen then DO NOT TURN OFF THE GP2X simply exit the emulator through the menu, then start it back up and it should be full-screen every time. I can succesfully boot and run games, but when i turn on sound its something wrong. The game itself runs att full speed but the sound is slow and has bad quality. Does anyone know what this could be? PEOPLE WHO WANT TO KNOW HOW TO GET THE BIOS, SIMPLY GOT TO GOOGLE.COM AND TYPE gba_bios.bin ITS LIKE THE FIRST RESULT THAT COMES UP ! jansport, as the sole copyright holder of gpSP's source code it is within my rights to change the license of future versions at any point, so long as it remains compatible with LGPL (which SDL uses), which does NOT require the source to be open. This is awesome program. Thank you Exophase. I can't believe it hasn't been commented on more than this. Must lend my support to this emu - a stupendous achievement. Desperate for an update though!! just tried Lego: Drome Racers, runs slowly (10fps, <50% gamespeed) =[ is this game just way too demanding to be emulated on the gp2x? it's a 3D racer, like mario kart, but the 3D graphics are better, more fluent (not sprites).. bah. CC_machine: Thanks, I updated my GMenu2X, the older one didn't have that setting. It's just a tiny bit of performance boost with that, but it's still there. Still am not near of the speeds in the video (how is that performance possible with that cpu speed setting..?) I was wrong about the savestates not written correctly on the sd, but there still is a problem with the slots. When I start a game and load a save state, no matter which slot I choose, the emu always loads the one in slot 0. The second time trying to load any slot leads the emu to load one that was picked first (so it's always one pick late). Sometimes the save state is saved badly (loading the state gives just a black screen and hangs the gp2x). When this bad save state happens to be in slot 0 it prevents the emulator to load any of the states because it always loads the slot 0 first after loading the game. One better have a file manager handy to delete the slot 0 if this happens. Or just use game saves only. Also I _really_ hated it when I had played minish cap for hours and hours and was finally in the last castle, the emulator always hanged 1 second after entering the room with the "tornados", thus preventing me to finish the game after so much playing.. Oh, the amount of cursing then.. I took a look at the source code but can't find the reason why the slots are behaving like that. Does anyone else experience that. Anyway, I might add an option for startup volume for roms because I hate the fact that I have to tap the vol down key tens of times after loading the rom. Um, not it doesn't go to full screen on start when you exit through the menu. I have exited through the menu every time and it never starts up full screen the next time. The latest release (09-2Xb_3) has awesome speed and I love the sound volume update. However FFTA tends to crash now after about 15 minutes of playing :( I'll try it out more..
Yeah, now it's confirmed: Final Fantasy Tactics Advance has a tendency to crash with 09-2Xb_3 release. I'm using the same cpu speed as with the earlier release and I do have the tweaks turned on. Maybe I'll try not to overclock as much next. The basic symptom for a crash is just to hang, freezing the display and no sound is output. One crash filled the screen with horizontal lines (thus maybe indicating that it's not an issue of the cpu overheating and halting). Hopefully this is just my gp2x acting nasty. And no, I haven't tested any other games with this release. The name of this emulator should change it has the same name as the psp version, we should get new version with more speed some games run slow. Handles everything I threw at it so far. BGTDA at 160 MHZ, FFTA at 180 MHZ. I'm not quite sure why Exophase is so protective of this amazing emulator though. Why can't others modify/improve on your great work? Ok, the issue with crashing is with my gp2x. For some reason it doesn't overclock to 270MHz anymore. With less overclocking everthing is fine. Stormbringer: what are you talking about? This is under GPL and anyone can make one's own modified build from sources. I think that Exo doesn't like the idea of uncontrolled branching, though. Maybe the project should be a lot more organized with responsible persons etc. At least, the project should be a lot more active.. I was planning to make a couple of things for the save state system (like, remember last saved state so you can easily continue from where you last left off), but there are no sources available for 09-2Xb_3 release. Could someone put the sources online, please? Could someone make a wiz compatible GBA emulator. None of the gp2x ones work on it. hello guys. i can't find the correct bios, found the version on emuparadise. it works on many games, but it says it's not the correct BIOS. can anybody send the correct one to me please? the mail is Saradas85@hotmail.it it would be very appreciated. thanks! Jansport: technically, if the author still owns the copyright on all the contributions (ie he hasn't used anyone else's work), he can still re-license the whole shebang under something else. Licensing under the GPL is not giving up your copyright. It's just that he can't revoke anyone else's licenses.